“Mush! Mush!” the man on the sled yells at the dogs pulling the conveyance. “Go! Go!” His yells are muffled and indistinct from the thick cloth tied around his face against the freezing cold on the Lamont Highlands. But the huskies don’t need his encouragement, anyway, running is what they were bred for. And run they do. Seeing them go, no one would ever guess they’ve been running for 20 miles already. They are less exhausted than the musher on the sled. He almost overlooked the small tree coming quickly towards him. “Haw!” he yells at his lead dogs. They obediently pass the tree to the left, just close enough that the musher has to duck under a branch hanging low with snow. And that’s your introduction to the exciting world of competitive dog sled racing or mushing. The word allegedly originates from the French yell “Marche!” to drive the dogs, which was mispronounced to “Mush!” by English speakers, eventually leading to the name of the sport. If you ever need someone to repeat what Wikipedia says for you, don’t hesitate to ask me. Mush! Mush! is not the first foray into mushing by the Lamont Brothers, that was Snow Tails five years ago – you wouldn’t have guessed from the subtitle of this game, would you? 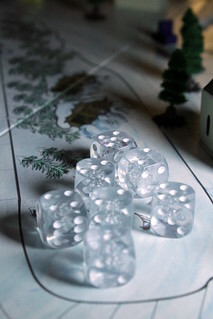 Snow Tails is still a popular racing game not only for its uncommon theme but also for its original movement mechanics. But we’re not here to talk about the old Snow Tails, we’re here to review Mush! Mush! that uses the same basic movement mechanics, but with its own twists. Your sled, represented by a card in front of you, drawn by two dog cards. Each dog card has a value from zero to four (five with specials), their sum gives you the forward speed to move your sleedle on the board. 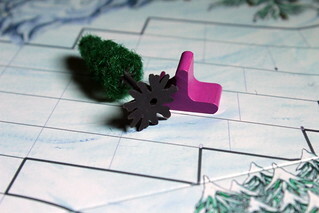 (I’m completely aware that “sleedle” for “sled meeple” is one of the most atrocious expressions we’ve ever come up with, but the year is almost over and I have a quota to meet.) Moving forward, however, is easy, even at the breakneck speed of 8 squares on the board. Even some wide corners can be safely taken simply going forward. But everything gets way more interesting when you add drift: when your two dog cards do not show the same value – your sled is unbalanced – you must drift the difference between them to the side of the stronger dog. That’s easier than it sounds. Imagine you have a four dog to the right and a two dog to the left, then your forward speed is six, and you must drift two spaces to the right. You may do the drifting at any point during your forward movement, so you get some flexibility to avoid obstacles in your way. You didn’t think all this was happening on a clear race track, did you? There are trees, buildings and other players to avoid, and drifting off the track is not recommended either. You also have to drift to navigate the tighter corners. To steer your canine conveyance, you play one of your five hand cards – or two, if they have the same value – to replace one of your current dogs. Then you move in the way described above. Even in a breakneck race like this, some planning is in order: you should know what card to play on your next turn, and maybe even on the one after that, because if you don’t you may find yourself headed straight towards the edge of the track with no way to stop. Crashing – no matter with what – forces you to take a dent card to your hand that can be used for absolutely nothing but takes up space in your hand. In a somewhat weird twist, hitting a tree also removes the tree from the board. Either you have some very strong dogs, or you’re racing beavers. 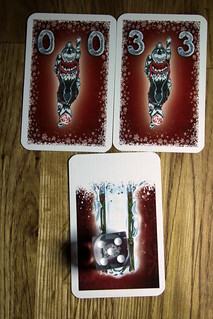 If your sled is balanced – both dog cards have the same value – you may also gain a movement bonus: you adjust the bonus die on your sled to show your position in the race – that’s the only use of the die, by the way, there’s no rolling in this racing game. After your regular move on the same turn or a later one you may use your bonus die and move up to its value straight forward. That’s a great catch-up mechanic for the mushers in the back and keeps them in the race even if they were lagging behind – provided they can keep their sled balanced. The bonus movement is the biggest difference to movement in Snow Tails where you couldn’t save the bonus for later but had to use it when you got it or not at all, often in very inconvenient places. The bonus die makes that more convenient and more strategic, so I’m very much in favour. Now, this wouldn’t be a Fragor game if it didn’t have some great, big components. Mush! Mush! comes with a bunch of plastic trees to spread around the track and crash into. They have such a high level or realism that they lose needles and you have a pile of green dust on the table the first time you unpack them. Wait, that’s not actually a good thing! But I’m nitpicking, it’s not a big deal, either. More interesting than the trees are the four different plaster buildings to place on your tracks. They are not mere obstacles to avoid, they also have useful bonus effects for anyone ending their turn on a space around the building, or in the line of the entrance door in case of the Tavern. At the Tavern, to start with that, you may increase your bonus die by two. Not bad, but for a real speed boost you should go to the Kennel: stopping there allows you to shuffle one of your value five dog cards into your draw pile. If you already have been going to fast, then stopping at the Chapel is for you: you discard all dent cards. God’s forgiveness even fixes your sled. And finally there is the Bothy where you can discard as many dog cards as you like and draw replacements. Making good use of the buildings, or maybe not making use of them sometimes, adds another thing to consider to your strategy. 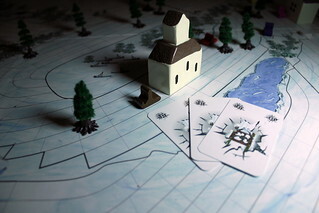 Placement of the buildings – and the trees, for that matter – makes a difference for the race, but there are more ways to make each race a new challenge: both sides of the huge gameboard, The Lamont Highlands and The Fragor Alps, show an area with multiple routes that you can block or open to create your race track. The manual shows four options for each side, but there are more. With some experience you can even reverse the tracks, creating tight turns where every straight course ends in a crash and you have to drift out of them. And if that’s still not enough, there are rules to run a multiple track tournament. Hand management plays an even bigger role in tournaments because you keep the dog cards in your hand from one race to the next. All those zeroes and ones you’ve been keeping so you could go fast? Doesn’t seem so smart when you start the next race on a sled pulled by obese pugs, does it?